Coasting on a motorcycle essentially means that the bike is free-rolling and not being controlled by the engine. This is not to be confused with ‘over-run’ which is explained towards the end of the page. Coasting occurs when the motorcycle is moving but has the engine disengaged by either holding in the clutch lever or by having the gear selector in neutral. It is referred to as coasting when the duration of time that the engine is disengaged exceeds that of changing gear. Why do some riders coast? It could be that they have not received professional training and are unaware of their bad habit. Other riders may use it as a technique to save fuel, though the benefits of this are minimal. Coasting whether on a motorcycle or using any other form of powered road vehicle is a substandard driving technique that should be avoided due to potential dangers. 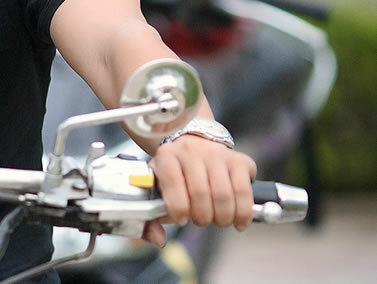 When the engine is disengaged whilst in motion, the rider has less control of the motorcycle. Often a rider may need power and to accelerate at short notice to avoid a hazard. Coasting will delay this, especially id there are problems selecting a gear. Can Coasting Affect my Riding Test? It certainly can affect both module 1 and module 2 riding tests if used to excess. Of course every rider coasts a little each and every time they change gear, but it’s essential that the engine is engaged and full control obtained as soon as possible. Excessive coasting during a riding test is almost certainly going to result in a failure. Whilst riding at speed, a rider may close the throttle, but the engine is still engaged as the motorcycle is in gear. This is referred to traveling on the over-run and is not coasting. Travelling on the over-run enables full control of the machine as engine braking and acceleration are available.